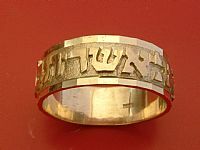 Letters are cut through the base of a flat yellow gold band that moves freely around the silver base. 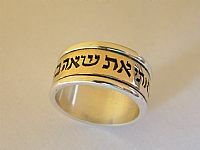 The yellow gold band is surrounding a solid sterling silver base ring. 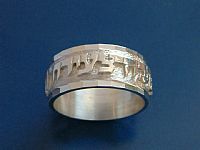 The rounded edges are done in sterling silver. 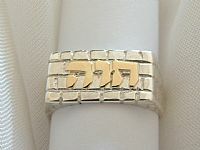 $259.00 GOLD & Silver: Size 4-5 can only fit 5 Hebrew words. 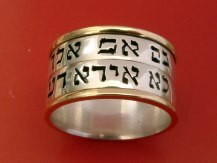 Kabbalistic Word/Saying Wedding Saying Number Saying: Here are some sample inscriptions. 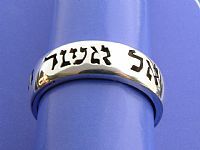 K2 72 Names for: Choose Any 6 W2 "Ze Dodi Veze Re'ei" This is my beloved and this is my friend. 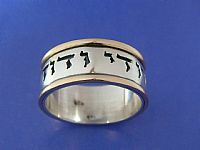 K7(size6 & above only) Ana Bekoach Gedulat Yemencha Tatir Tzerurah W7 "Simeni Kahotam Al Libcha" Put me Like a seal over your heart. 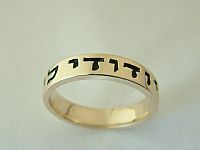 K8 I AM That I AM (Hebrew or English) W8 "Tihye Nafshi Kshura Benafshech" Let our souls and spirits intertwine. 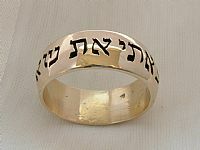 Copyright © 2008 by New Thought Kabbalah All rights reserved. Revised: 24 Aug 2015 21:34:33 -0400 .